Job training programs funded by the Neighborhood Jobs Trust (NJT) have made a significant impact on many participants’ economic well-being, a new report shows. The Fiscal Year 2015 report, released by the Mayor’s Office of Workforce Development (OWD), found that upon job placement, program graduates saw their incomes more than double to an average hourly wage of $14.90 per hour – above the city’s living wage. Created in 1987, the city’s Neighborhood Jobs Trust (NJT) is a special public charitable trust that funds jobs and job training programs for Boston residents who face barriers to employment. The trust is replenished by fees from large-scale commercial developers building in the city of Boston. 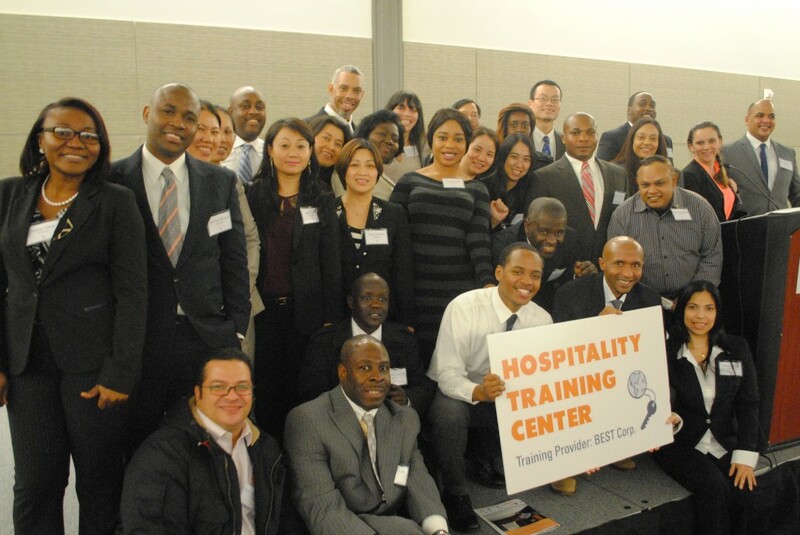 Graduates of the BEST Corp. Hospitality Training Center, a job training program funded by NJT. Over the course of Fiscal Year 2015, the OWD awarded over $1 million in NJT funds to 20 training programs in industries as diverse as the hospitality, health care, construction, culinary, early education, and banking & finance sectors. Among the participants served by NJT-funded programs, 92 percent were people of color and 81 percent held a high school degree or less. Residents from every neighborhood in Boston were helped by NJT-funded programs. Read the press release or watch an interview with NJT administrators to learn more about the success of the Neighborhood Jobs Trust. For a closer look at how the NJT turns new construction into economic gains for residents, read about how the Millennium Tower helped Chinatown residents, or how the Aloft and Element Hotels created hospitality jobs.